KusanagiGirl: Big, Big News! 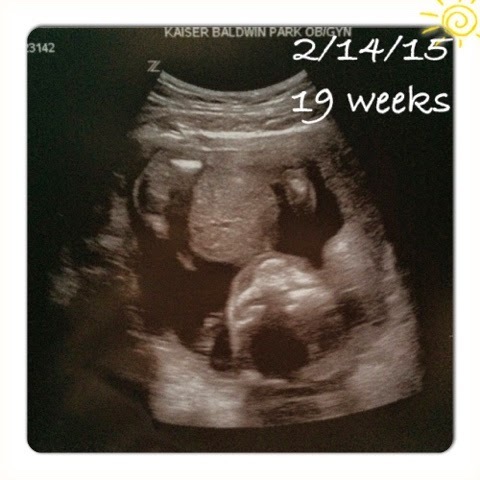 Baby #2 on the way!!! I hope everyone had a fantastic Valentine's Day weekend! Our little family celebrated by going out for an early morning breakfast, dropping Jellybean off with her grandparents who are visiting from Taiwan, then going in for an anatomical ultrasound, of which finding out Baby #2 is a girl was just one of the highlights of the day! So, I'm pretty bad an keeping this type of news a secret. How was I able to keep my mouth shut for 19 weeks? Well, I didn't know I was pregnant for most of the 19 weeks!!! I actually missed all of the first trimester! I have a new level of understanding for women who say they didn't know they were preggers. For me, the only symptom of possible pregnancy I had was an acute sense of smell and being turned off from certain kinds of foods. I just thought that it was residual food aversion from Jellybean's pregnancy. I have since never felt the same about tomatoes and tomato sauce. The other symptom was the missed period. It should have been a no brainer but I thought my period was still irregular because I'm still nursing Jellybean. I only got my period twice last year (wish it could be like that all the time!!!!) so I didn't think anything of it. I even took a home pregnancy test in September, which was negative. When did I get suspicious? My brother, mother and father were joking that I've gained a few pounds, of which I've maintained I never lost the baby weight. I told my husband and he bought me a membership to 24 Hour Fitness at the beginning of the new year. I went for about a month and was getting discouraged that I wasn't losing any weight even though I also wasn't gaining any weight. Then I noticed that my tummy under my belly button was starting to look a bit rounded. There's a "fat" round look, then there's a "structured" round look, and my tummy's roundedness was looking structured. So, I took a HPT and it came back positive. I believe my reaction was WTF?!?! But it's all good! Even though the timing is not what we expected, we're still pretty excited about our addition! My husband and I both have younger siblings. For my part, I'm really close to my brother and I just couldn't imagine what my life would have been like without him. This is exactly what I've always imagined my children having... A relationship with each other that is different, but no less trusting, loving and deep, from their parents. That's it for now! Have a great day everyone!